Whether you’re a long-time homeowner or a new one, there are certain terms you should know, in order to make the maintenance and installation of your roof much easier. If you’re starting to feel like roofers are speaking gibberish to you, you may want to take a look at this glossary to see the definitions of terms you should know when it comes to your roof. From A to V, these are some of the most common terms that many homeowners might not know. 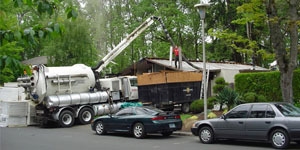 Asphalt: An oil byproduct that is used to waterproof shingles. Blisters: Air bubbles that can form on an asphalt roof after installation. Buckling: One or multiple shingles protruding in a vertical line, due to improper installation. Deck: The surface over the rafters where the roofing material is applied. Eaves: The horizontal, lower edge of a roof, typically extending beyond the side to ensure maximized weather protection. Flashing: The application of metal pieces or roll roofing used to prevent water from seeping into the cracks and seams of the roof. Gable: The exterior planes that come to a triangular point of a sloping roof. Hip: An external angle of a roof formed by the intersection of two sloping roof planes that runs from the ridge to the eave. Open Valley: A technique of construction that requires the roofing material on both sides of the valley to be trimmed, exposing the metal flashing. Overhang: The sections of the roof that hang over the building. Rafter: A piece of the frame that supports the deck, usually a beam. Rake: The inclining edge of a slope roof over a wall. Re-covering: The process of covering an old roofing system with a new one. Re-roofing: The replacing an old roof system. Ridge: The horizontal angle of two sloping roof planes at the highest point. Ridge Shingles: Shingles that cover the ridge and hips of a roof. Ridge Vent: Allows the roof to maintain a more stable temperature, by promoting optimal air circulation in the attic. Roof Slope: The degree of incline of two sloping planes on a roof. Self-Adhered Eave and Flashing Membrane: Underlying waterproof shingles which offer protection against water infiltration due harsh weather. Starter Strip: Asphalt roofing applied at the eaves behind the first row of shingles that prevent water leakage by filling in the gaps. Thermal Effect: The natural effects of warm air rising while the cooler air sinks. A good roof design takes advantage of this effect through venting systems. Valley: The internal angle of a roof at the intersection point of two sloping roof planes.